Wonderful walking with these giant, ancient trees in coastal California. See Sharon Gibbs' thoughtful, poetic memories of walking here. THIS PAGE IS AT AB EARLY STAGE OF DEVELOPMENT. PLEASE HELP US BY MAKING SUGGESTIONS AND SENDING PHOTOS! THANK YOU! The following is Sharon Gibbs' piece on walking here, which was on our longlist for our 2011 Travel Writing Competition. Thank you, Sharon, for bringing this walk to our attention! I stood in awe among the massive California Redwoods, and thought, the word ?tree? cannot convey the redwood's authority. My August morning journey under their thick canopy awakened my senses. I drank in the earthy odors of moss, bark, and pinecones mixed with sweet scents of wood strawberries, salmonberries, and thimbleberries. The fog-shrouded misty air felt like a thousand wet kisses on my face. I looked up, trying to spot the song sparrow calling out in the distance, and noticed how the sun's rays filtered through the fog with a mystical sense. The stillness of this vaporous air provided the perfect environment for the rich tapestry of lacy ferns, mosses, rhododendrons, and oxalis. The dampness of the shaded humus-rich forest floor cooled my sneakered feet. The tranquility of this paradise called for me to connect to it, leading me to feel balanced and whole. I sat down to rest, leaning against a Redwood. Feeling the roughness of its thick fibrous bark along my spine grounded me; I could feel the strength of its years. Looking up, I saw it reaching for the heavens - poised, sturdy, and determined. Redwood trees have many lessons to impart. Their silence speaks of wisdom and patience. They know where they stand and radiate presence. 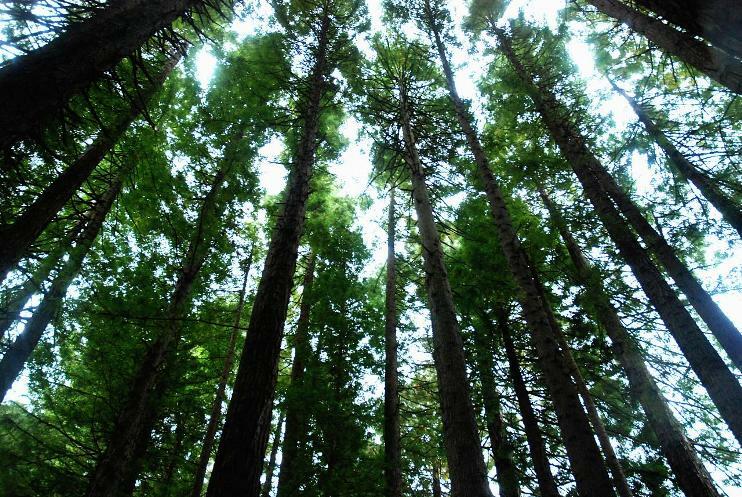 Redwoods show us how to thrive - and thrive, they do. Believed to be the largest and oldest organisms in the world, the commanding redwoods have been in existence for more than 135 thousand years. Redwoods were present on earth at the same time as the dinosaur! Some of the living trees are believed to be close to 3000 years old. How did this marvel defy death, despite the ravages of fires, storms, and time? Bill, the Park Ranger who guided our walk, revealed many interesting facts. Their longevity is primarily due to their strong defenses. They don't burn easily, since there is no resin in their bark. A high tannin content provides great resistance to fungus diseases and insect infestations. Periodic flooding doesn't suffocate them, but strengthens them by bringing sediment deposits on which they thrive. Their main enemy -aside from man - is heavy wind. Despite their size, their roots are quite shallow, extending only a few feet into the soil. Instead, the roots grow laterally, intertwining with those of other trees. Bill continued sharing his knowledge, "Over 300 feet in height and 30 feet in circumference, it is hard to imagine that this giant tree grew from a tiny seed no bigger than a tomato seed. Each tree may produce up to 10,000 cones; each cone bears about 2,000 seeds. Mature trees may disperse 200,000 seeds per year, scattered only as cones are opened. Cones hang on the tree green and closed for up to 20 years. Douglas squirrels or the larvae of a tiny cone-boring beetle may cause cones to open, but fire is the key agent in the dispersal of seeds. It causes the cone to dry, open, and drop its seeds. Fire also consumes logs and branches that have accumulated on the forest floor. Their ashes form fertile seedbeds and enhance redwood seedling survival." I considered the ways in which redwoods can regenerate: either by seeds or by new sprouts that come from a downed tree's root system, stumps, or burls. One cannot deny their perseverance. I was amazed with their history, presence, and teachings. Even though I felt miniaturized among these giants, an empowering sense came over me. Through the misty silence of nature's cathedral, I could feel their message. Did I have the ability to be a greater person - patient and giving as the redwood? Adopting the redwood's style - what an intriguing thought. Can I stand grounded, bending gracefully with the winds of change? Am I able to possess character and take the good from tough times while maintaining resilience and spirit? Could I form a resistance to the 'infestations' of society and instead, live purely and with wisdom? Can I surround myself with peace and harmony? Is it possible for me to connect with nature, treat it with respect and honor, and value all it has to offer? Is it easy to always grow towards the light, reach for the heavens, and remain poised and sturdy? Am I wise enough to know where to stand and radiate a presence, while expressing myself with ease and beauty? Shouldn't I learn that sometimes silence is the best way to communicate? Most importantly, why not nourish and protect one another, like our forest fellows? I, for one, want to live my days striving to be as 'big' as the redwood, although I will never try to convey their same authority - that honor is for them, and them alone. I know exactly the feelings you convey when amongst the Giant Redwoods. Your writing is wonderful I only have one exception and that is the California Redwoods are located in the Northwest and not the Southwest. I live just a few hours away and have spent many wonderful afternoons hiking the redwoods. Walkopedia says: Thank you! Very helpful.